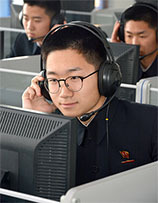 Most recently, I visited Pyongyang Foreign Languages School under Pyongyang University of Foreign Studies. Choe Nam Chol, head of Chinese department, guided me to the 3-4 class of the department. The higher you go up, the more difficult you feel at the start of mountaineering. But, you will get a bird’s eye view of beautiful scenery if you reach the summit. The same is the case with studying foreign languages. It is difficult for you to learn foreign languages at first, but you will gradually have greater interest in and appetite for it. This is a paragraph that a student of the class said in fluent Chinese at an oratorical presentation on the subject of “Learning foreign languages and mountaineering”. Choe Nam Chol explained that the school was established in 1958 and specializes in teaching such foreign languages as English, Russian, French, Chinese, Spanish, etc., besides common subjects of general senior middle schools. It accepts applications for enrolment among the graduates of junior middle schools across the country and gives 3-year courses, he said. Students were taking listening lessons in language laboratories equipped with modern facilities. Ri Jong Hyok, a student, said it is essential to master foreign languages and that he would learn more at Pyongyang University of Foreign Studies after graduation so as to make a contribution to the prosperity of the country. In line with the government’s intention of giving importance to training talents, the department directs efforts to bringing its teaching closer to reality and conducting it in a practical way. To this end, it sees to it that lecturers improve their qualifications and upgrade their teaching materials and students talk to each other in Chinese. It also regularly organizes a contest of general knowledge on the Chinese history, economy and culture, an oratorical presentation and such contests as translating sentences, writing vocabularies and reciting and imitating the dialogues in Chinese films in order to make its students master the tone of Chinese and improve their hearing, reading and analyzing abilities. Choe Nam Chol told me that his students achieved brilliant successes several times in international Chinese contests. In particular, Ryu Ho Song and Sim Thae Bom, students of the above-said class, won the cups and certificates of award respectively in total standings and in the category of Asian Continent in the 11th Chinese Bridge Proficiency Competition for Foreign Secondary School Students held in Yunnan Province of China in October last year, bringing honour to the country. Their lecturer Pak Yun Sik won the ace teacher prize. At the end of the competition, foreigners gave unstinting praises, saying that the abilities of Korean students elicit the admiration of the public and their superior marks far outdistancing their rivals showcase the high level of education in the DPRK.